This week’s most popular Waste Business Report was Energy from Wood Biomass. 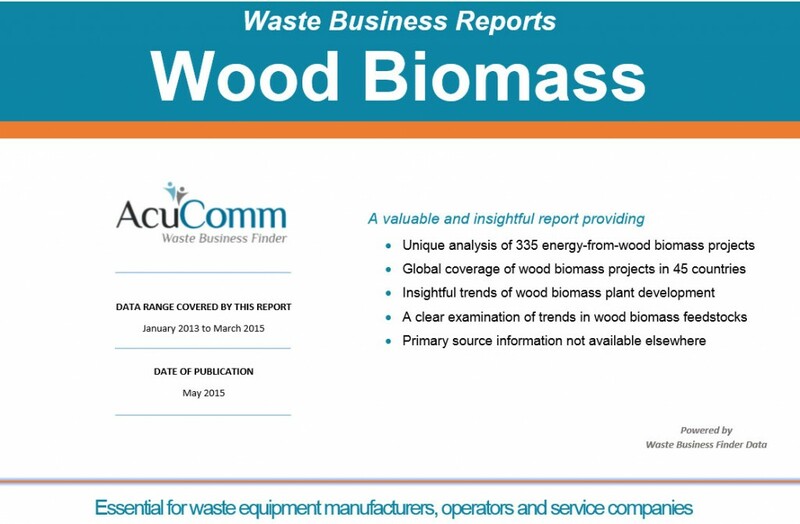 If understanding this marketplace is important to your organisation, then AcuComm’s Energy from Wood Biomass Report is the only comprehensive source of industry-specific insights, analysis and intelligence founded on ‘real-time’ project information. Click here for more information on May’s report. In the week ended 21 June 2015, AcuComm added new or updated waste projects to our Waste Business Finder database, worth an estimated US$3,562 million and reported waste capacity of 3.6 million tonnes. This takes the total estimated investment value of projects to US$341 billion. Projects last week were dominated by the United States, followed by the United Kingdom, France and Australia. The average waste project is worth US$112 million. There are naturally wide variations in average project value, due to the size, duration and complexity of different types of projects. If you’d like to find out more about AcuComm’s Waste Business Finder, you can do so by clicking here. Each new waste project represents ongoing investment of an average of around US$100 million. Wood and other biomass-based feedstocks account for around one third of all new investment in waste technologies, reflecting a move away from traditional power generation in many countries. 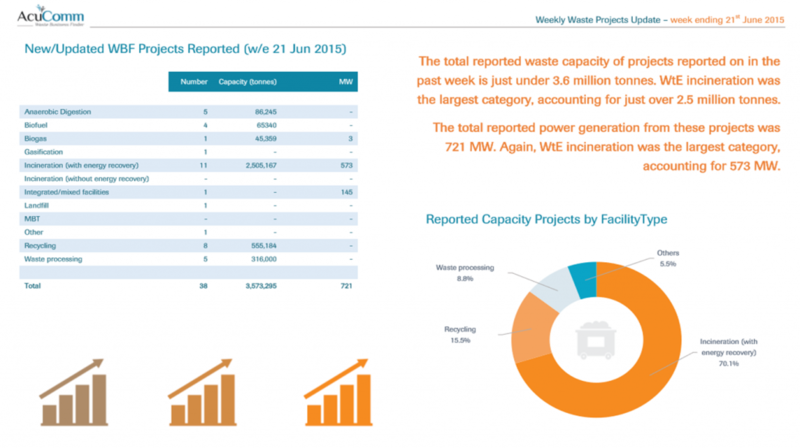 WtE incineration projects represented over 70% of reported new or planned waste project capacity in April 2015. 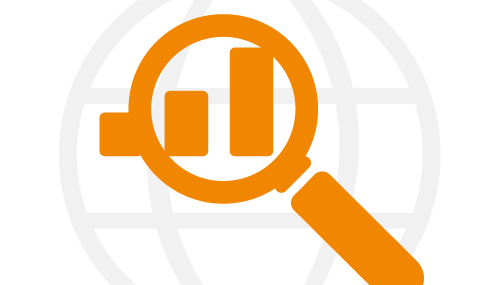 For further detailed ‘real-time’ analysis of trends and developments across the waste, renewables and energy sectors, take a look at WBM by clicking here. AcuComm’s monthly issue of Waste Business Monitor (WBM) will provide you with a comprehensive overview of trends and developments that are shaping the local and global waste, renewables and energy sectors. To see for yourself, download your free sample copy here WBM April 2015. In the early days of the internet, major newspapers decided that circulation and advertising revenue was more important than content, this turned news into a free for all commodity. Consequently, this development caused difficulties for business intelligence industry specialists like Espicom, where I was Chairman. Espicom were solely dependent on people paying for our specialised and independent news and analysed content, which was the foundation of the business. This change of perception in the value of news content, brought on by the need for higher circulation figures, resulted in us having to find a means of adding further value to our content. At the time the solution appeared obvious; we had to seamlessly integrate news with our analyses. However, this was easier said than done. Espicom had over 100 country, company and technological reports. Each report included 200-500 pages of factual information, compromising of an abundance of statistics, analyses, forecasts and commentary. I remember discussing this “Nirvana” idea with people from The Economist Intelligence Unit, Euromoney, Reed Elsevier, and many other publications. We all faced the same problem – how can we increase the value of our news content? The only obvious solution was to make a connection between the news, the market information and the forecasted details in the reports. However, we came across a significant problem. The market information and forecasts were based on information that was out of sync with ‘Todays News’ and ‘The Real World’. 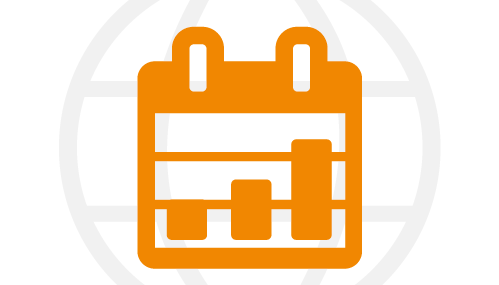 At Espicom we quickly realised that our only other option was to see if we could continuously update the report information in line with ‘today’s’ events. Not as easy as you may think. All recognised market statistics were regurgitated through government or official institutions before being released; there was no solution to speeding up this 1 or 2 year process. Therefore, we attempted to categorise the news to capture significant statistics allowing for some form of analysis. However, we were stuck in the age of word processor and A4 formats that limited our options. Consequently, we had to admit defeat. The idea took a backseat and the main focus of our activities was geared towards reports and analyses. Fast forward to today and AcuComm! The business incorporates all the ideas we had 10-20 years ago but due to impractical practices and inadequate systems, we were never able to realise their true potential. AcuComm is specifically set up around providing strategic sales and market information, together with speedy access. We effectively took control of the information and shaped it for its true purpose; to quickly inform and activate businesses. We demolished the ‘out-of-sync’ problem and removed the necessity to rely upon the institutions that limited our progress and efficiency. So when we say “Real-World’ Practical & Strategic Sales & Market Intelligence”, at AcuComm we mean it! AcuComm’s database of waste industry projects and investments has grown rapidly. We now have over 3,000 separate projects in over 150 countries. Existing data and statistics provided by the government and industry bodies about the waste management industry were often out-of-date, incomplete, inconsistent and poorly-presented. Therefore, we decided to use the information we had to create a picture of the global market for waste treatment, as well as using our Waste Business Finder to create a set of statistics that was up-to-date and reflective of the actual level of real world investment. We wanted to know where investments were being made, in which sectors, countries, how large the investments were and who was making them. We wanted to present this information in a form that is understandable and usable for individuals working in the waste management industry. We have presented these results in our monthly Waste Business Monitor (WBM) publication. The information is presented coherently and consistently by allocating a principle feedstock type and a principle technical/physical means of disposal. This allowed us to present the data in various ways, either through number of projects/investments, value of investments, geographic location, annualised waste capacity, planned power generation and project timescales/operational dates. None of this is a statistical exercise, the data is derived directly from real-life, ‘real-time’ data collected by our research team. Once a project is reported by our team, the data and information collected from it feeds into our publishing statistics within a couple of weeks. We are always improving our calculation methods, categorisation and presentation as the database continues to grow. It is an on-going process and the database continues to grow as we receive much welcomed feedback from the project stakeholders themselves. Our on-going aim is to provide up-to-date information about the global waste industry. Here at AcuComm, we feel that there has been a lack of this previously, therefore we want to provide this data so people have a thorough understanding of what is happening currently, alongside signposting future trends emerging within the industry. MSW Recycling has made it a second week as our most popular report. 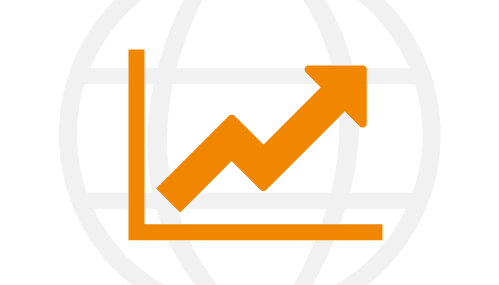 From April’s report, you can gain a detailed and global perspective of who and what is driving MSW recycling projects around the world. This level of market insight and analyses is unavailable anywhere else. To see what is included for yourself, click here. In the week ended 14 June 2015, AcuComm added new or updated waste projects to our Waste Business Finder database, worth an estimated US$4695 million and reported waste capacity of 3 million tonnes. Projects now have an estimated total investment value of US$337 billion. To find out more information on the projects that are added to our Waste Business Finder daily, click here. The Budget Presentation & Going from Zero to Hero! As Chairman of AcuComm, my past experience from my days as CEO of Barbour ABI, (early 90s) kept coming to mind whilst developing AcuComm’s ‘Executive Package’. I had been newly appointed and was asked to present the forthcoming year’s budget and a 5 year forecast. Wanting to make sure I pulled together a brilliant presentation, I double-checked figures and talked to the relevant staff again and again, before submitting the budget for review. The budget meeting went pretty well and I was confident that I had put forward a good case for the forecasted result. Dean from McGraw Hill agreed, but asked me to improve the profit figures as they were too low, saying “that it shouldn’t take you too, it’s easy enough right!”. My initial thoughts were that I couldn’t do this, we were at our limit, what could we do to find new sales? The only answer I could think of was to invest more money, but I wouldn’t dare suggest that. Looking back, an ideal scenario would have been to create a list of potential customers who were actively looking for business and the potential value these companies represented, or even better, to be able to instantly put my hands on a list of these exact potential clients at that moment in time. I could have walked out of the meeting, gone straight to the sales team and handed them a list of prospect customers with contact details; this would have provided them with the required information to increase revenues instantly. I could have walked out of the meeting a hero, with everyone winning; however, this perfect scenario did not happen. Instead, I agreed I would do what I could to meet Dean’s demand. This story highlights a common problem with budgets, forecasts and strategic planning, how do you implement it? Or even better, how do you obtain information for strategic plans, which reflect today’s world, and find a solution that can be acted upon directly to generate the desired result? That is why AcuComm have generated ‘The Executive Package’; which includes ‘The Waste Business Monitor’ and ‘The Waste Business Finder’. It represents exactly the solution I wish I had had available to me all those years ago in that meeting. 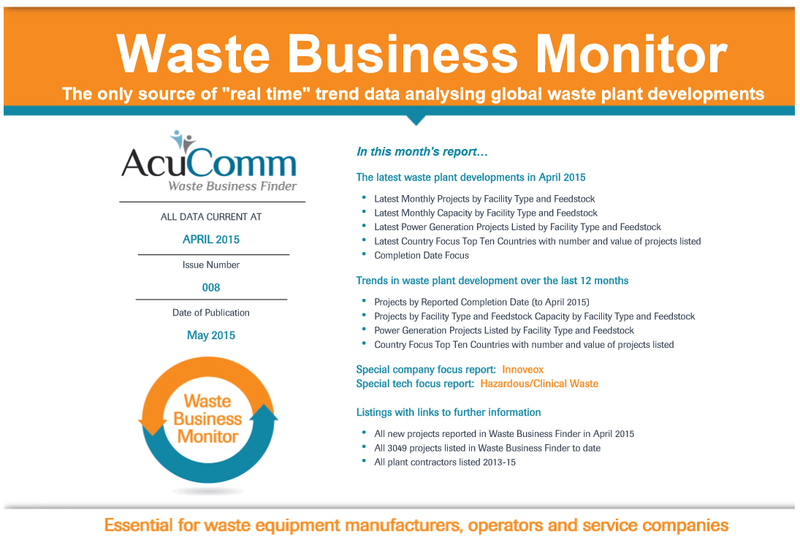 The latest edition of AcuComm’s Waste Business Monitor is out now! 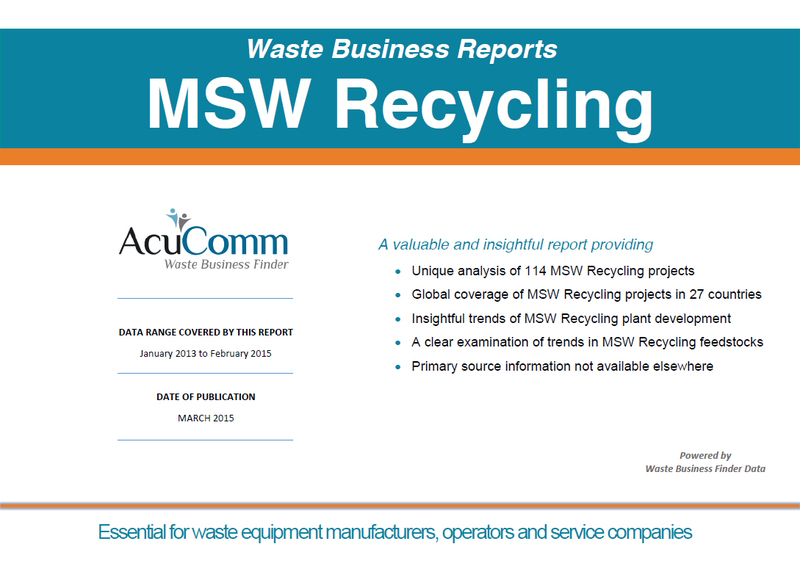 The latest edition of AcuComm’s Waste Business Monitor is out now. The report provides an ongoing and comprehensive analysis of current projects in the global waste industry, enabling waste equipment manufacturers, operators and service companies to establish levels of activity in their different sectors. The special company focus report for this month in on Innoveox, while the special tech focus report surrounds hazardous and clinical waste. Aside from MSW, organic materials such as wood and other plant-based biomass are key areas of investment. China remains a leading investor in waste, along with the USA, Europe and Asia, each tailored to meet specific needs. In 2015, Innoveox’s first commercial project – a five year contract for hazardous waste treatment on the island of Reunion – is due to become operational. Various types of company will be involved in a typical hazardous/clinical project’s lifecycle, from planning to construction, equipment supply, operation, maintenance and upgrading.